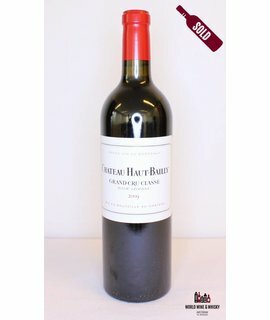 Château Haut-Bailly is a Bordeaux wine from the Pessac-Léognan appellation, ranked among the Crus Classés for red wine in the Classification of Graves wine of 1953 and 1959. The winery and vineyards are located south of the city of Bordeaux, in the commune of Léognan. Château Haut-Bailly's vineyard is located along the left bank of the Garonne river. Neighboring estates include Château Malartic-Lagravière, Château Smith Haut Lafitte and Château Carbonnieux. The estate's second wine is named La Parde de Haut-Bailly. The vineyard is believed to have been created during the 16th century by a rich family from the Pays Basque region. By 1630 it was acquired by the Parisian banker Firmin Le Bailly, who gave his name to the estate. A classification of the leading Graves châteaux by Wilhelm Franck in 1845 illustrates that Haut-Bailly had become known by then, but came to be famous in 1872 when it was bought by Alcide Bellot des Ministères, a known vitculturist at the time. Followed by a period of prosperity, such as the 1878 vintage judged outstanding among its peers, there came a decline. With the onset of phylloxera, Bellot des Ministères also neglected to follow the examples of other estates who combatted the disease, and instead of grafting, relied on spraying with copper ammonia solution. After Bellot des Ministères' death in 1906, the estate came to his widow, and then her daughter. After two decades, Haut-Bailly was sold to Franz Malvesin who during his ownership experimented with some questionable techniques, such as pasteurization and early bottling. After his death in 1923 practices were reverted to normal, though under the various following owners, the results were unremarkable. In 1955, the property was bought by the Belgian wine merchant Daniel Sanders, beginning a prosperous period of quality and restored reputation. Though known for his meticulous control, there was near the end of Sanders' life a perceived dip in quality in the 1970s, as he was reluctant to release management control to his son, but this eventually happened at his death in 1980, and Jean Sanders was able to resume progress. For several years the late oenologist Émile Peynaud was retained at Haut-Bailly. The current owner, since 1998, is the American banker Robert G. Wilmers, with Daniel Sanders' grand daughter Veronique Sanders functioning as general manager, and Gabriel Vialard employed as technical manager.